Don’t let the comparatively warm temperatures fool you. The mercury is set to drop to bring a handful of constant snowfall throughout the rest of the day. From there, we’re looking at a few clear days before the snow returns again. Thursday night looks fairly promising before the weekend might be a very powdery one indeed. It should be a great week here in Nozawa Onsen. We’ve had a few guests comment of late that there doesn’t seem to be a lot of people around. Of course, February drops off only slightly from January and we are still very much enjoying the main part of the season. 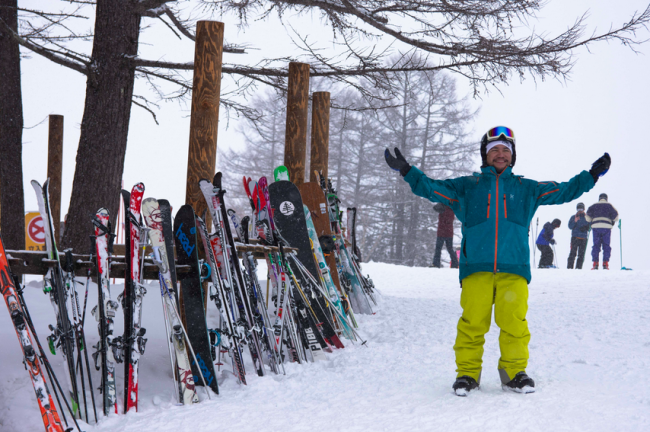 However, Nozawa Onsen does tend to retain that relaxed feel (along with the traditional village vibe) throughout the season when compared to most places. That’s one of the reasons why we love it! What is the top of the mountain looking like right now? Weather; Cloudy up top with a bit of blue sky. When you’re done with a day sliding down Mount Kenashi, you’re likely to be in need of two or three things; an onsen, a beer and a delicious meal. We’ve got you covered! Check out our ever-popular “How To Onsen” video along with our downloadable Restaurant and Bar Guide. While we’re at it, don’t forget to give Nozawa’s newest dining option a go; the Kongo Night Market.